A unique and delicious taste sensation results from this recipe which is flavored with a large variety of Asian flavors. These tastes include McCormick Chinese Five Spice, Hoisin Sauce, Vietnamese Fish Sauce and Sesame Oil. If you’re a regular here, you’ll know we like to marinate our grilled foods before cooking and this recipe is no exception. Combine all of the ingredients (except chicken in a small bowl. Mix, then microwace for 1 minute. Mix, and microwave again for 30 seconds. Mix, and microwave one more time for 30 seconds. Whip well with a fork. Set Aside. Wash and rinse chicken well then place in a one gallon sized zipped style heavy duty plastic storage bag. Pour the seasonings over top of the chicken. Place in refrigerator for 1 to 4 hours. Heat grill (We’re old fashioned an enjoy charcoal grilling. Use your gas grill if you like). 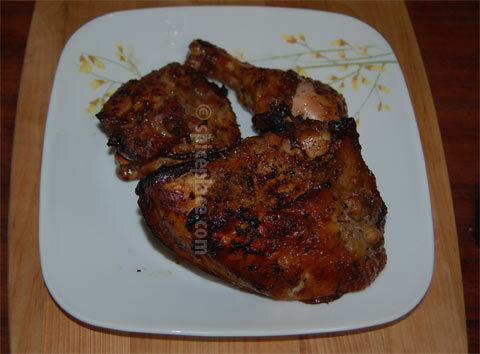 Remove chicken from marinade and save marinade in a paper cup or ceramic cup to use during cooking. Cook chicken using indirect heat (i.e. coals on one side of grill and chicken on other). Cook for one hour to one hour 15 minutes, turning meat and marinating with reserved marinate at 15, 30 and 45 minutes. Test doneness with meat thermometer to 165° F. Discard any remaining marinade. Do Not add marinade after 45 minutes because it’s touched the raw chicken. Serve with Steamed Corn on the Cob, Cole Slaw, and/or a tomato/cucumber/onion salad.